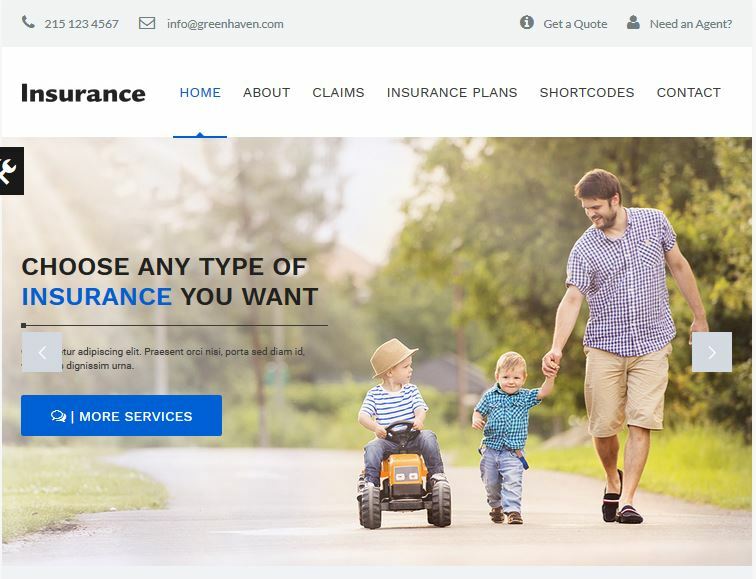 We’ve shared the Best Insurance WordPress Themes for health insurance, car insurance, Insurance agency, Insurance Broker and life insurance websites. In 2017 given below themes are Best Responsive WordPress Insurance Themes. Don’t wait just get the best one theme for your website. Developing a website from scratch can be very expensive and time consuming. In some cases, you do not have the expertise to develop a website good enough to help you take a firm grip on your online marketing efforts. If you are in the insurance business, why go through the hassle of having a website designed from scratch when you can buy insurance WordPress themes affordably enabling you to fasten the entire website development process? The site has to represent an exceptionally professional and sensible look as people are putting faith in you. They need to feel confident that your company will keep its promises if something goes unsound in their lives. Moreover, the layout need to be simple and responsive to navigate and transmits the huge amount of information in a straightforward manner. In this post we’ve compiled a list of Best WordPress Insurance Themes which are suitable for number of insurance types and any other finance-based organizations. Fascinate your targeted audience withthis Insurance WordPress Theme, crafted to boost the popularity of your financial business, it has powerful yet flexible structure. It boasts everything you would ever wish for an impactful online presence. Need an array of ready-made web pages? This theme has Cherry Services, Cherry Projects, Testimonials, Cherry Team Members and a wide range of opportunities to involve site visitors into your story and to create a trustworthy image of your online business. Want to let people book an appointment online? Each and everyone will be able to check your schedule using any device with Timetable and reserve a spot for consultation with an easy-to-use booking form. In case a visitor has a question or feedback for you, he can fill out a contact form to request additional information or reach company officials. 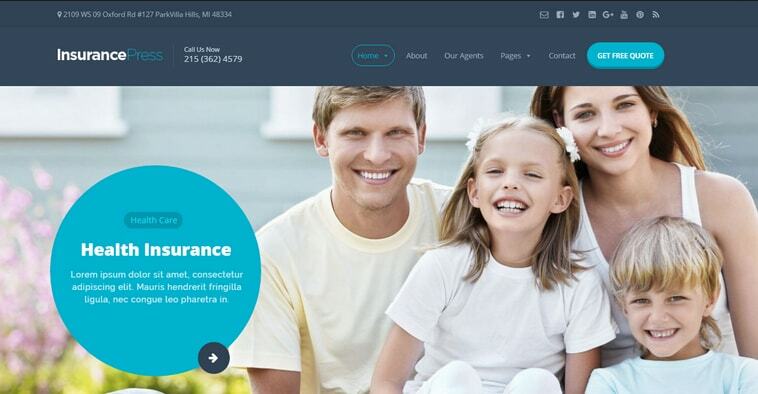 Behold stunning design and impeccable functionality of Insurance WP Theme by means of live demo preview. 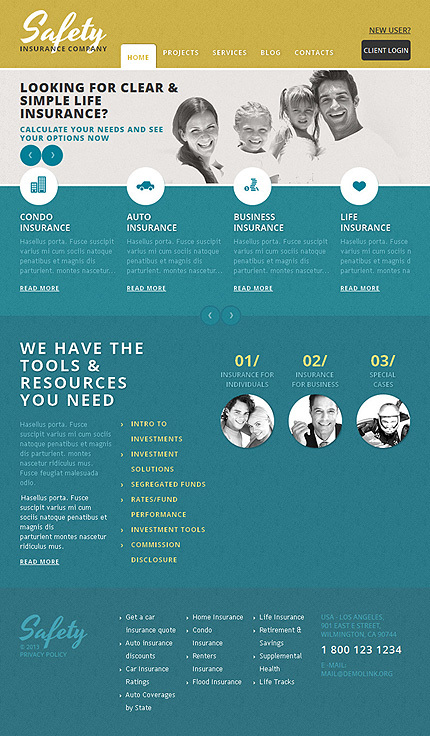 Clean and responsive insurance agency WordPress theme for business or similar website. One page or multi page website. Premium Slider Revolution plugin and drag and drop page builder. This theme is one of the best WordPress Insurance Themes. 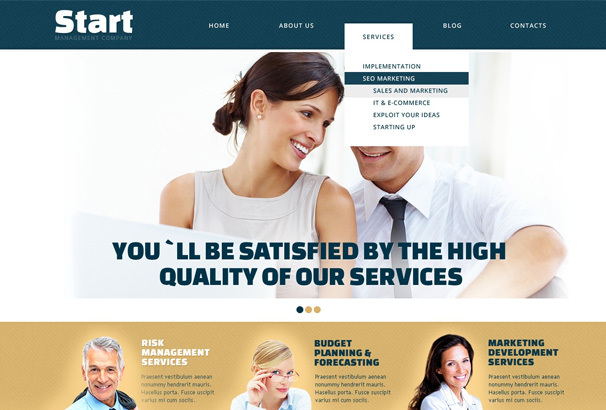 Start is an amazing insurance WordPress Theme that comes with responsive layouts that even alter their size as per screen resolution. Giving a professional touch to your websites has never been so easier before. The inclusion of user-friendly features such as improved short-codes, attractive dashboards and filtered galleries are enough reasons to select this theme for your insurance, legal or corporate business websites. 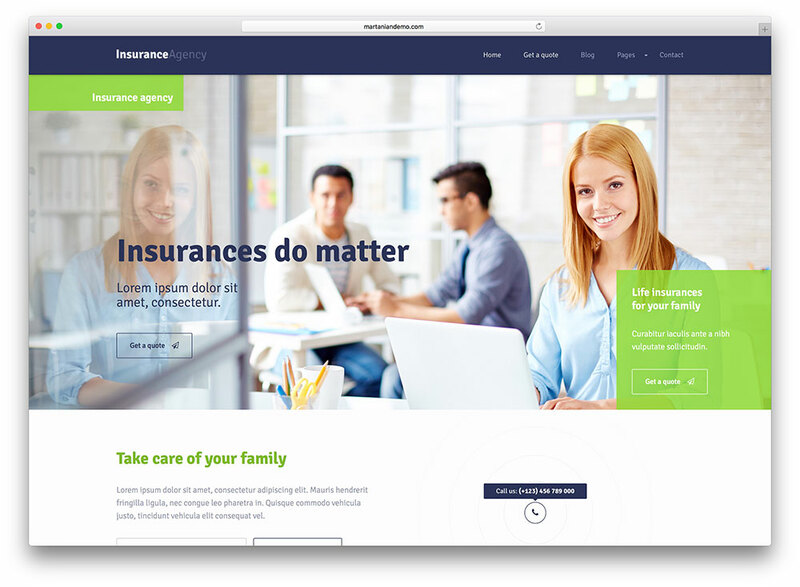 We are delighted to introduce Insurance WordPress theme highly suitable for creating websites for consulting business and insurance company, independent auditors, agencies, trading companies. With the special features to this niche segment, Insurance theme is the answer for your requirements. WordPress insurance quote plugin. 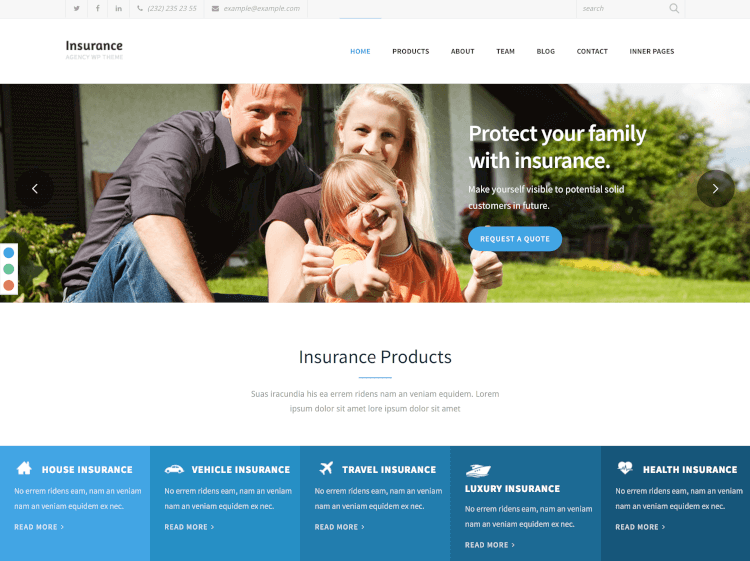 Insurance is a fabulously perceptive, easy to handle and technologically adept Insurance WordPress Theme, designed specifically to cater the needs of insurance companies, insurance agents and insurance wholesalers. 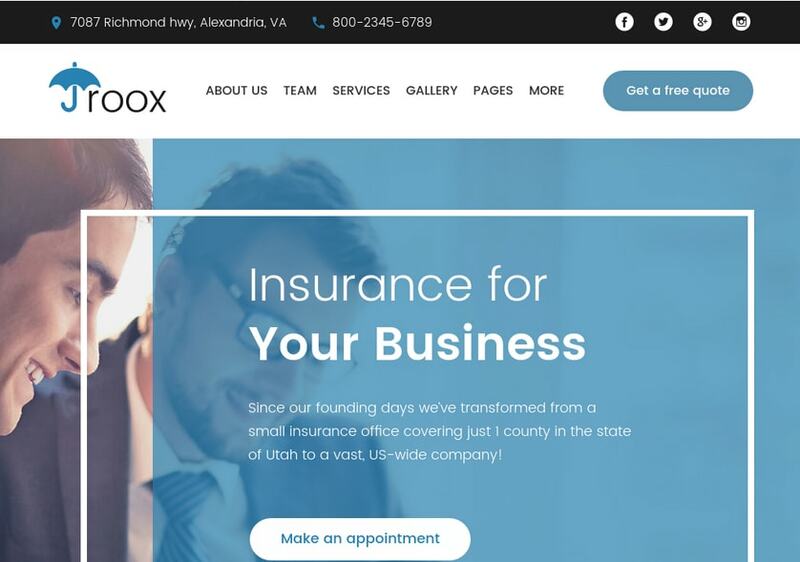 This insurance agency theme has persuasive Drag and Drop Page builder enables you to create your own pages from the scratch or you can also modify the available beautiful templates according to the specific needs of your business. In addition, the robust short codes extend the functionalities, allowing you form Get A Quote forms as well as Contact forms for your expected clients. The large number of fonts and color options will make your website look bright and colorful. It’s definitely a theme you can’t take a chance to avoid. 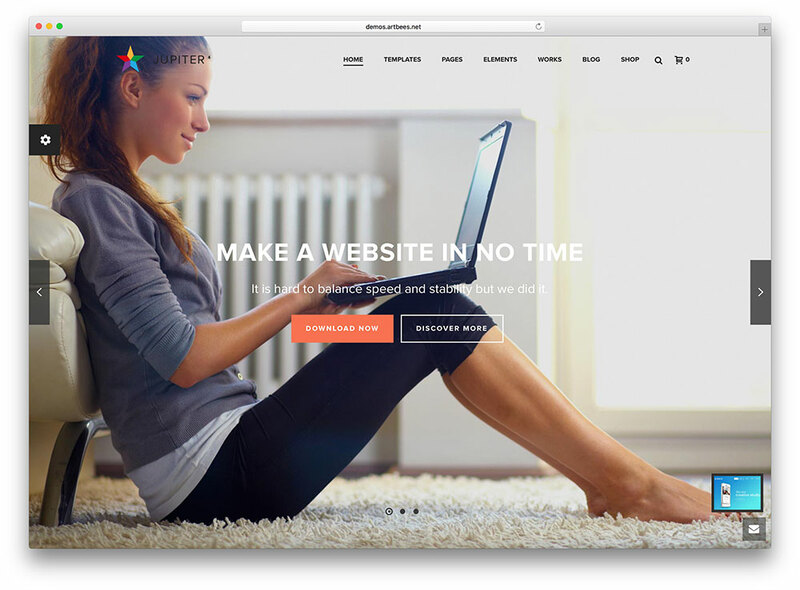 Bridge is a highly manageable, amazingly powerful and incredibly convenient WordPress theme. Basically, BRIDGE is appropriate for corporate websites such as legal, insurance or real estate ones. Assembled on the dynamic QODE structure, BRIDGE incorporates more than 100 exclusive website demos topped with 24 custom layouts (comprising both standard as well as completely inventive site layout options). By employing the effective Admin Interface choices you can include the magnificent Qode sliders, Parallax sections and many other functions with exactly zero coding needed at any stage. The best part is each demo is completely customizable and you can control your site layouts and other elements as per your own unique set of requirements. 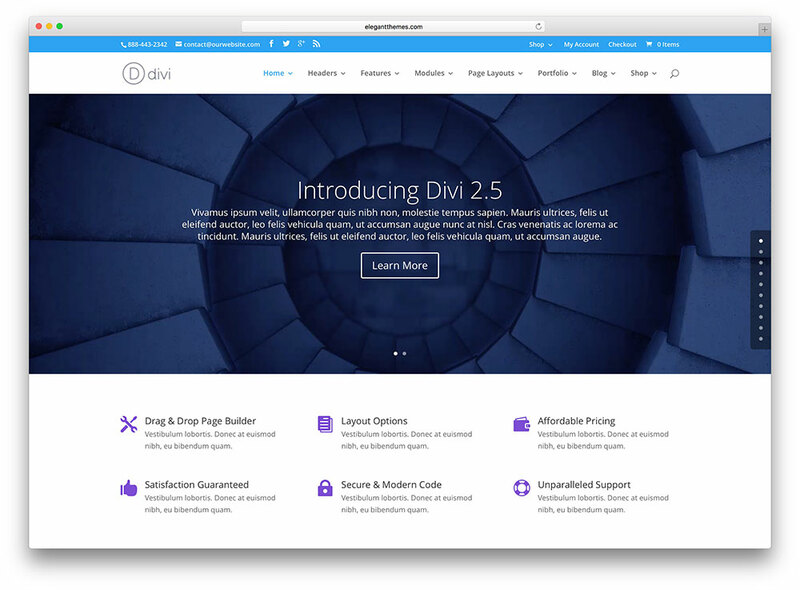 Divi is a remarkably creative, extremely effective and utterly manageable WordPress multifunction theme. The theme because of its flexibility fits in diversified requirements of the site. 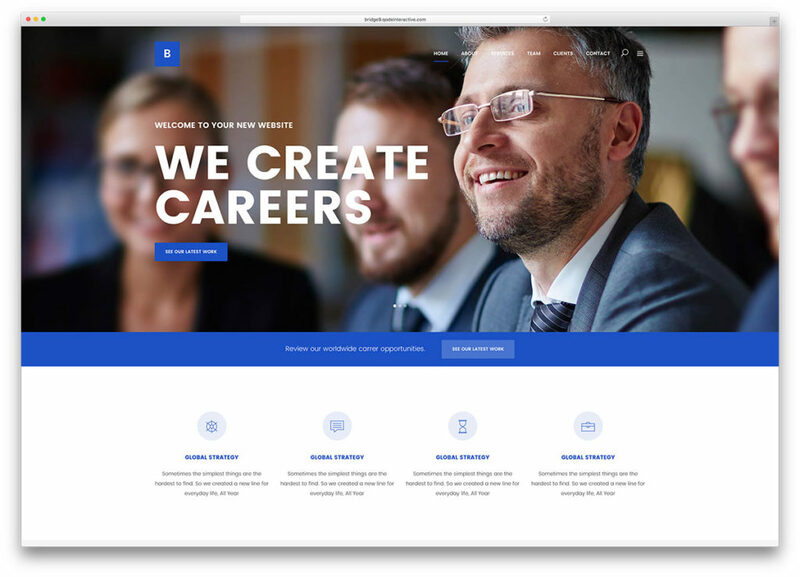 Divi offers countless professionally designed templates and customized options, making it a perfect choice for insurance companies, law firms and attorney professional sites. The easy-to-use drag and drop function with infinite fonts and color choices, Retina ready icons and easy breezy customization options give WordPress developers enough freedom to modify things as per their own requirements. Add staff pages accompanied with gadgets and smart codes, build pricing plans, include all types of state-of-the-art customization choices or include headers and footers in appealing Parallax animations with Divi’s regular updates and lifelong customer assistance. An ultimate game changer! 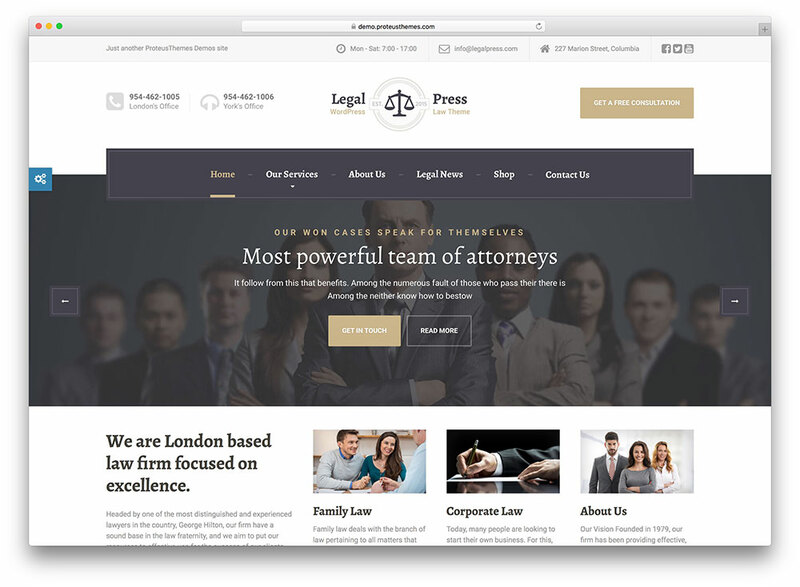 LegalPress is a compelling, business-focused, professional WordPress theme which basically targets legal firms, real estate company websites, real estate agent sites and basically all kinds of professional business units. The theme is armed with a wide array of professional layouts and templates which you can apply to give your insurance WordPress website an amazing touch. Through customization options, you can give a personalized feel to your websites and the presence of WooCommerce plugin gives you freedom to promote your products within few hours of installation. Cover insurance WordPress theme has a 100% responsive design. Features are bootstrap, WPML ready, Admin Panel , Cherry Framework, Responsive, Back To Top Button, Sliced PSD, Calendar, Drop Down Menu, Social Options, Tabs, Google Map, Google Fonts, Custom Page Templates, Crossbrowser Compatibility, Drop Down Cart, Search Engine Friendly, Tooltips and Advanced Theme Options. It also has blog, portfolio functionality and language support being English. The template is well documented with its set up and installation guidelines attached in the documentation folder. MySQL 5.0 or higher, PHP 5.3 or higher and the Mod-Rewrite Apache Module can host the platform. 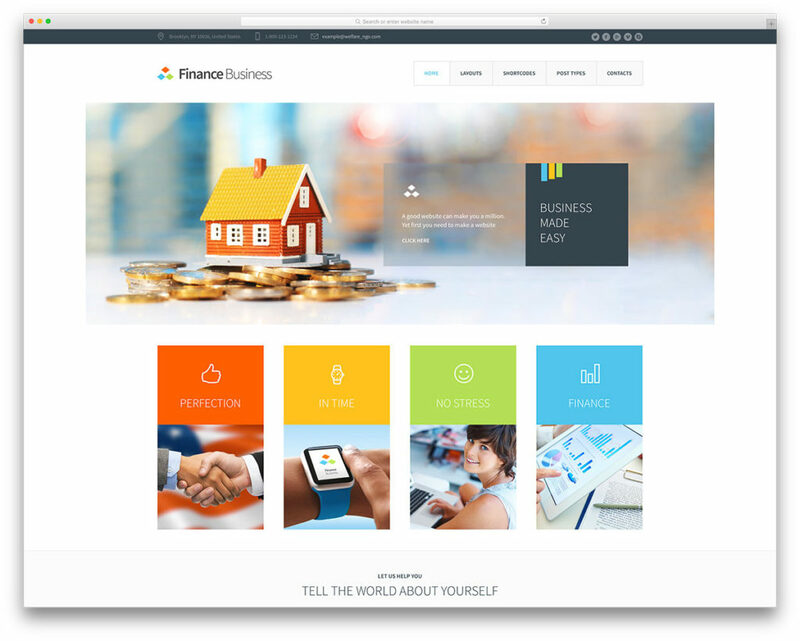 Finance Business is an impressively comprehensive, modern, attractive and interactive theme that caters small to large sized organizations. E-businesses offering Finance related services like accounting, real estate and insurance can use this theme to attract their potential clients. This theme is loaded with number of widgets, tools, templates, short codes and other custom-made features that can help you create your million dollar insurance website. 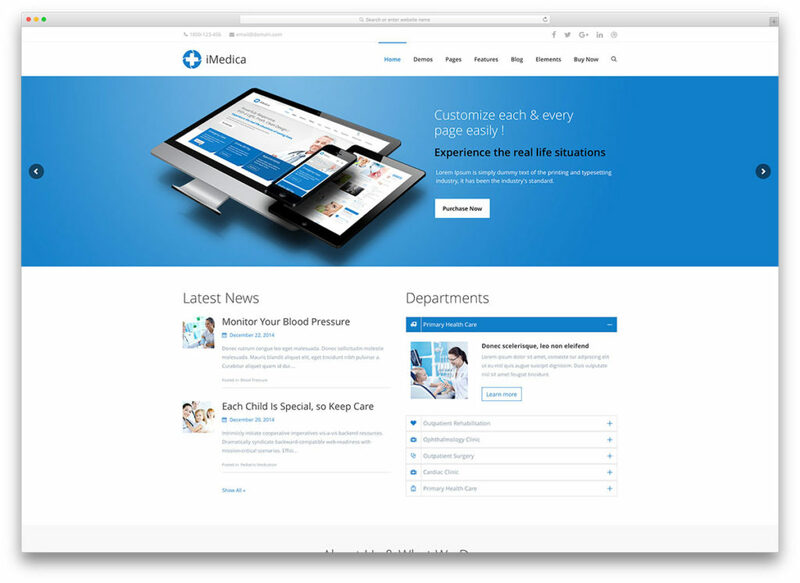 iMedica is an all-inclusive, feature-rich theme designed specifically to cater medical organizations. The presence of retina-ready graphics, responsive code and over 20 homepage layouts give developers a free hand to build a persuasive website. Moreover, the theme also includes the Visual Composer, Ultimate Add-ons plugin and gobs of other features to facilitate users at its best. 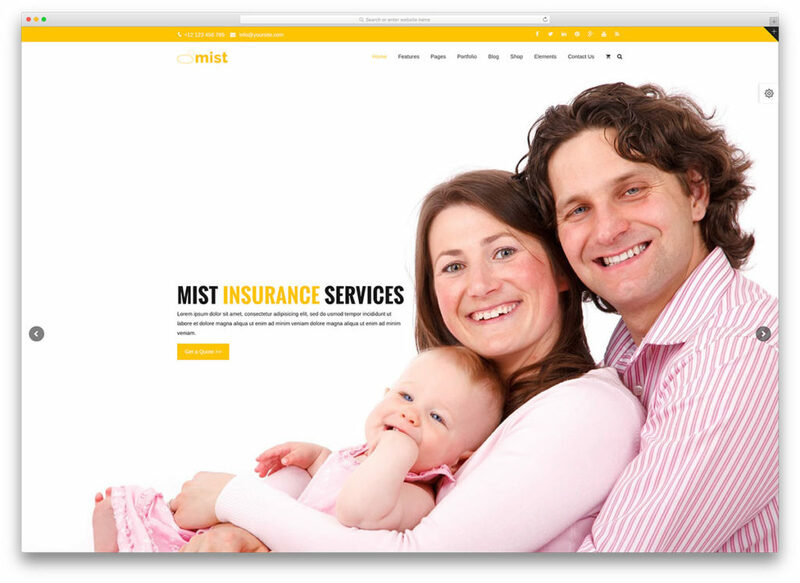 Mist WordPress insurance theme is an effective, multipurpose theme that comes with unmatchable flexibility and tons of amazing features. The theme is built on Visual Composer and incorporates diversified sidebar variations to give users added control and freedom. Because of its adaptability and compatibility with number of popular plugins, this theme can be used by various businesses for enhanced productivity and output. 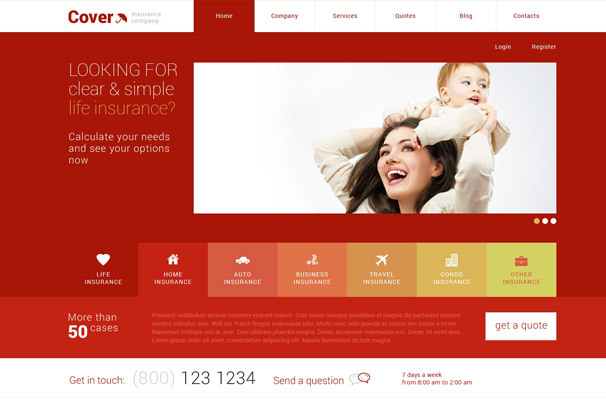 Broker insurance theme is a dynamic, technologically coherent and safe as well as dependable WordPress theme. The theme specifically intents to cater finance, business and insurance concerns and is stuffed with number of advanced and robust features including HTML5, AJAX,CSS# and Parallax. 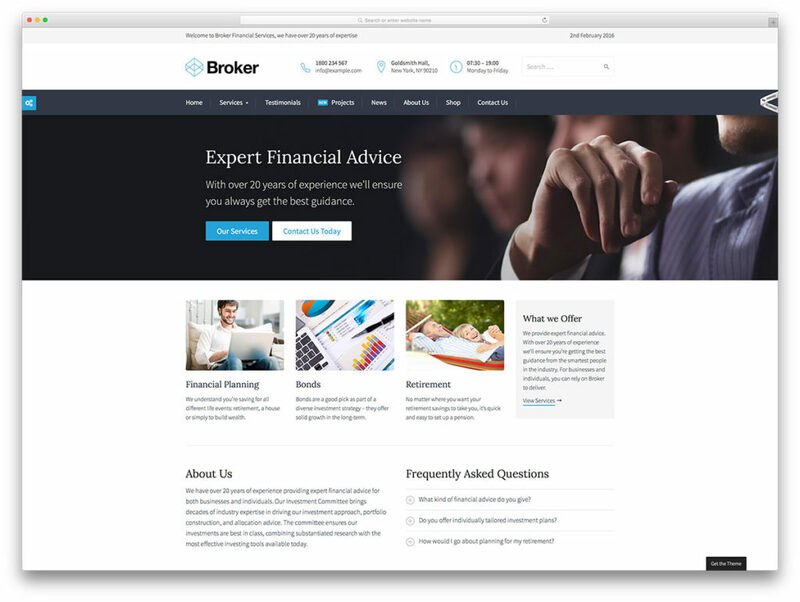 The Broker theme is created with a practical Visual Composer Plugin and also intensified by WooCommerce integration. Moreover, the inclusion of CommerceGurus Toolkit is an added advantage for all e-business holders. 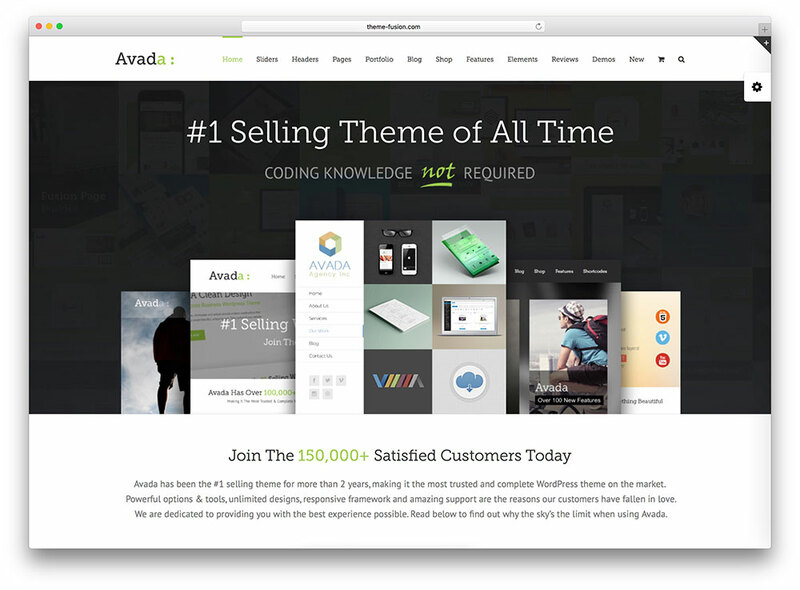 Avada is an incredibly efficient and remarkably flexible multipurpose WordPress responsive theme designed particularly to meet the diversified requirements of different business or finance related websites. From the swift Fusion Builder to the impressive Revolution Slider, Flex Slider 2, Parallax Layer Slider and Elastic Slider. This theme covers all the prerequisites needed for building an intriguing website. Moreover, you can also direct your users with the help of in-built MegaMenu or can even promote your products through popular WooCommerce plugin. When it comes to quality, performance and reliability, the X WordPress theme is assuredly a winner. This extravagant WordPress theme is an excellent illustration of flexibility, power and strength. X shines when applied on legal, insurance or estate agency websites. It is a multi-concept WordPress theme loaded with plethora of portfolio choices so that you can exhibit your professional work. The most interesting feature is the existence of native WooCommerce integration that enable users market their products directly from the website and that too without any extra charges. 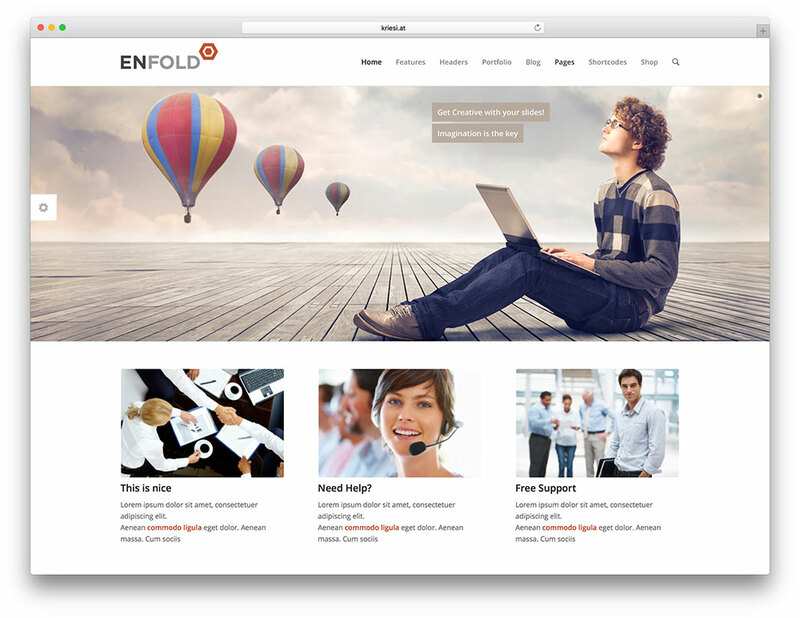 Enfold is an Avia Framework built uncluttered and highly professional multipurpose WordPress Responsive theme featuring countless powerful features required to control the structure of a huge variety of website standards. This theme is perfect for corporate websites, insurance sites and firms related to legal and accounting affairs. An exclusive, custom-made Drag and Drop Template Builder allow users build any possible layout. Supplementary styling choices are also accessible for each entry, pricing pages or portfolio features. The availability of WooCommerce plugin integration let users market their wares, whereas an impressive Layerslider Slideshows will captivate your potential clients. Be Theme is an absolutely exciting yet amazingly flexible WordPress Insurance Theme. This feature-rich theme is ideal for building corporate, legal and insurance websites. Be Theme is an all-inclusive theme featuring number of intriguing features such as Revolution Sliders and Sticky Headers. It comes with an impressive Muffin Page Builder that facilitates developers to construct outstanding website, whereas the Muffin customization options can be used to give sites a personalized touch. 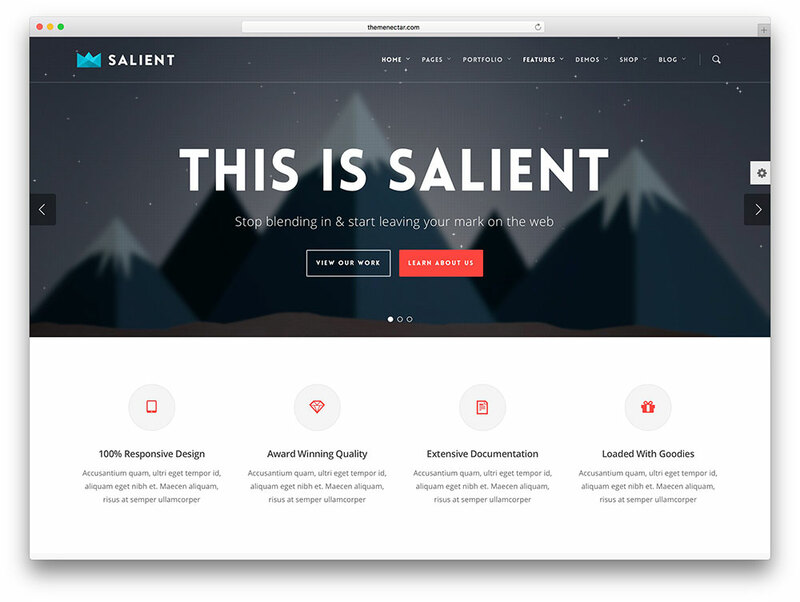 Salient is another powerful multipurpose WordPress responsive theme that lands with a myriad of customization options, hundreds of short codes and countless template and layout choices, giving users an opportunity to augment the functionality of their insurance websites. The theme incorporates masonry and grid blog layout choices to let users construct unique web pages. In addition, the WooCommerce is inherently supported so that you can market your products with the use of a simple plugin. Jupiter is absolutely simple and visually stimulated powerful WordPress Theme designed particularly to target commercial and corporate websites. Thanks to the perceptive drag and drop builder and plenty of pre-added templates and layouts. With this theme you can build an exceptionally appealing yet highly functional website for any legal, finance, insurance and other corporate business types. 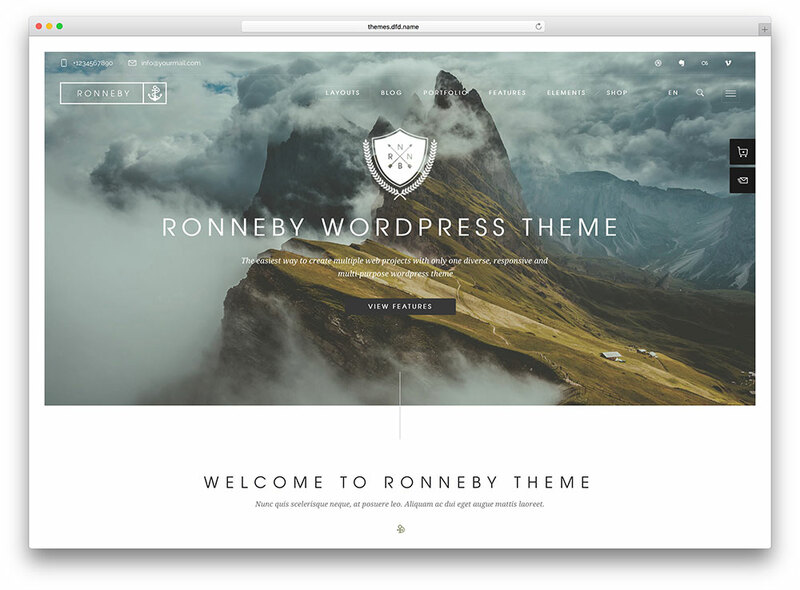 Ronneby is an all-inclusive, complete package incorporating hundreds of customizable features that can be integrated in number of unique approaches to construct impressive, intriguing websites. The inclusion of the powerful Visual Composer along with Slider Revolution Plugins ensures increased functionality, while the availability of WooCommerce integration let users easily market their sites. 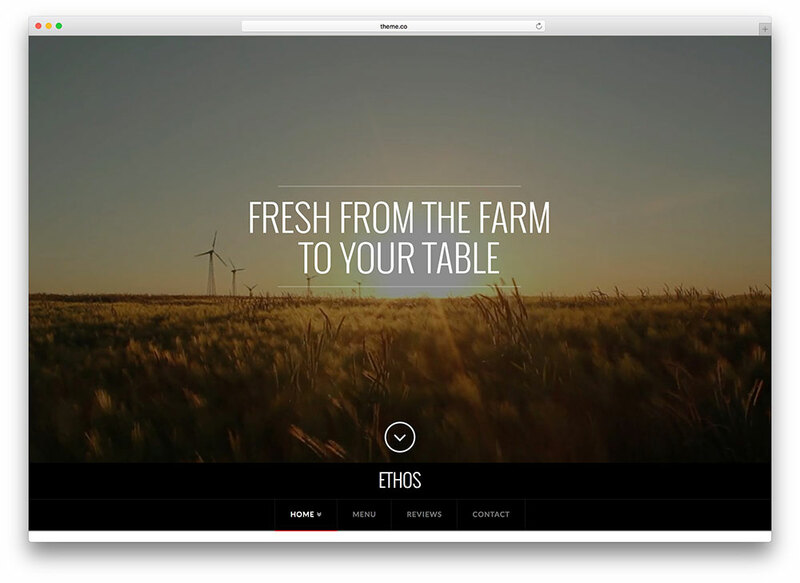 Moreover, the dozens of custom widgets and Parallax seamless scrolling effects will give new life to your website. Unicon is another powerfully coded, visually appealing and incredibly functional WordPress Theme designed specifically to cater the website building requirements of commercial or corporate business units. Countless Retina-ready icons integrated with dozens of imaginative shortcodes will keep your site visitors engaged. Intriguing Parallax-fueled sliders are accessible via Revolution Slider plugin which gives users an added control; whereas the WooCommerce integration will help you create amazing online portals. 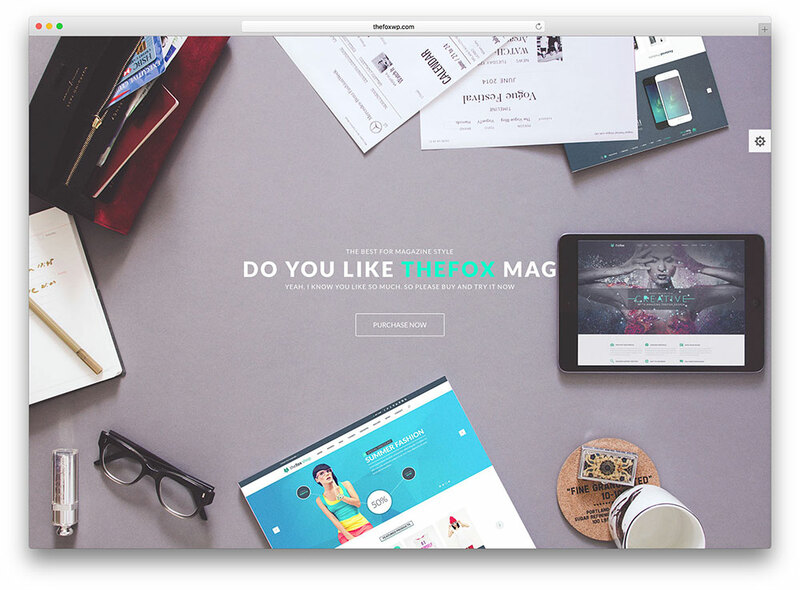 The Fox is an ingeniously adept, seamlessly coded and brilliantly devised WordPress Responsive Theme which helps users create outstanding websites in only few clicks. This theme offers exceptionally clean user interface along with number of powerful features, making it an ideal pick for corporate, legal or business websites. The presence of over 30 extensive homepages with more than 250 customizable design choices gives developers enough freedom to build amazing websites. This theme comes with a native WooCommerce support, providing you an opportunity to market your wares conveniently on your site. WordPress Insurance company theme will make your site easy to navigate for all clients. Its features include Advanced Theme Options, Search Engine Friendly, Drop Down Cart, Favicon, Google Web Fonts, Tabs, Social Options, Tag Cloud, Tooltips, Custom Page Templates, Sliced PSD, Back To Top Button, Calendar and Drop Down Menu. It has a blog, portfolio functionality with installation and set up instructions attached. The template is well documented for your own good. Its major features are WPML ready, Admin Panel and Cherry Framework. This WordPress life insurance theme supports mod_rewrite apache module, MySQL 5.0 or higher and PHP 5.3 or higher. Its features range from being WPML ready, bootstrap to admin panel, responsive. It also has advanced features that include back to top button, google pap, being search engine friendly, tooltips, tag cloud, social options, Google web fonts, sliced PSD, drop down cart, a favicon, a dropdown menu and a host of other features. This is designed with a mix of emerald green and black to show how trustworthy your company and the services it offers are. The hosting requirements are MySQL 5.0 or higher, PHP 5.3 or higher and the Mod-Rewrite Apache Module. This template is ideal for all types of sites dealing in the business of insurance. Features are Admin Panel, cherry Framework, WPML ready, Responsive, Bootstrap, Back to Top Button, Custom Page Templates, Sliced PSD, Drop Down Cart, Drop Down Menu, Search Engine Friendly, Social Options, Tabs, Advanced Theme Options, Calendar, Favicon, Google Map, Tooltips and Google Web Fonts. Again, this template is well documented with information regarding its set up and installation attached in document folder. This is designed not only for insurance but also for business websites. It has a website search feature at the footer. It has features like Advanced theme options, custom page templates, drop down cart, favicon, google map, drop down menu, search engine, social options, tabs, sliced PSD, calendar, tooltips, tag cloud and google web fonts. Mod-rewrite apache module, MySQL 5.0 or higher and PHP 5.3 or higher support this theme. With its features well documented, those offering home, car or auto insurance services stand to gain from this template. 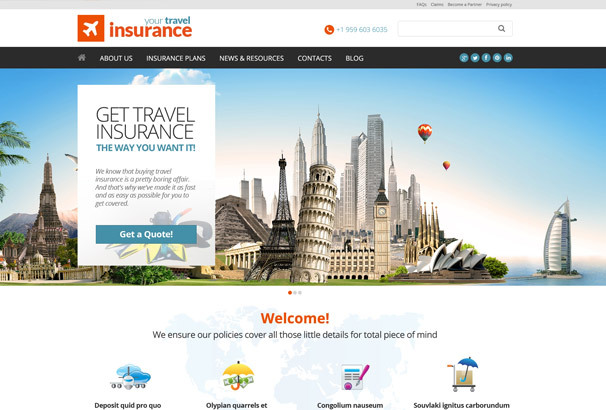 Your Travel Insurance theme is another minimalist yet highly appealing insurance WordPress theme which because of its clean, easy-to-use interface is ideal for traveling companies or tour planners. The availability of number of useful features and tools give developers a free hand to exhibit the most relevant information such as policies, location, tips and testimonials about the advertised company. This is perhaps what you need to establish a solid online presence. You can embed your social media profile at the header for easy social sharing. The theme can be hosted from MySQL 5.0 or higher, mod-rewrite Apache module or PHP 5.3 or higher. Its features are tooltips, tag cloud, favicon, google map, drop down, sliced PSD, calendar, search engine friendly, advanced theme options, social options, custom page templates, drop down menu, google web fonts, back to top button, tabs and calendar. The theme is well documented with English language support. It also has video integration and audio player just like all other WordPress themes. This Safety insurance WordPress theme reflects the safety that comes with your insurance company in its marine and blue colors. It is a well-documented theme with all installation instructions presented in document folder. It is an easy to navigate theme comprising the following features; dropdown menu, tag cloud, favicon, tabs, social options, google web fonts, custom page templates, sliced PSD, back to top button, calendar and advanced themes option. It supports MySQL 5.0 or higher, mod-rewrite apache module or PHP 5.3 or higher, enabling it to support all types of insurance businesses. Its features include an admin panel, being fully responsive, cherry framework support and bootstrap framework support. For bootstrap, you need version 2.3.1 and 2.3.1 for cherry framework. Hosting requirements are PHP 5.3 or higher, mod_rewrite apache module and MySQL 5.0 or higher. This Safety Insurance WordPress has a spacious content area that you can use to describe your insurance services in details. It has useful features including but not limited to Cherry Framework, WPML, Admin Panel, Bootstrap, and Responsive. It is supported by MySQL 5.0 or higher, mod-rewrite apache module or PHP 5.3 or higher and is well documented. I’ve shared best and responsive insurance WordPress themes list with you. I do like all themes and I’d recommend you to try out these themes for your businesses site. Please let me know which theme you like the most? I’d love to interact with you in the comment box below. Thanks for sharing the collection, can you please share here the insurance premium comparison theme/calculator script. Hi Usman – I’ll find one and share it with you later. Really different insurance wordpress themes collections list. thanks for sharing! Thanks for your appreciation. I hope you’ll share it with your friends. 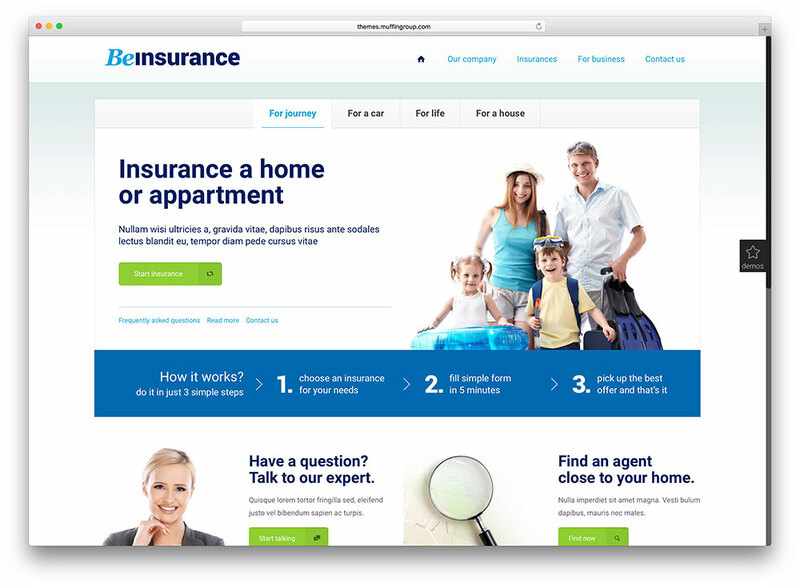 Check out our newest insurance WordPress theme specially created for the insurance websites. Our theme compiled with gripping home pages, blog, shop and many pre-made templates. 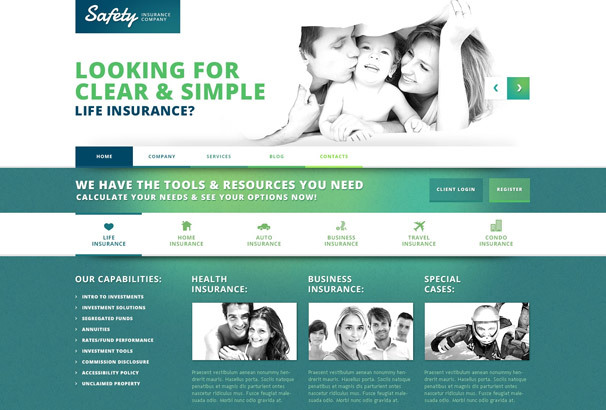 As well as all the essential and advanced features needs for the best insurance website also included with this theme. Check out the theme and take in on your collection. Thanks you for updating us for the insurance theme. We’ve added it in the collection. I hope our readers will like it. I was looking for a theme and I found it here. 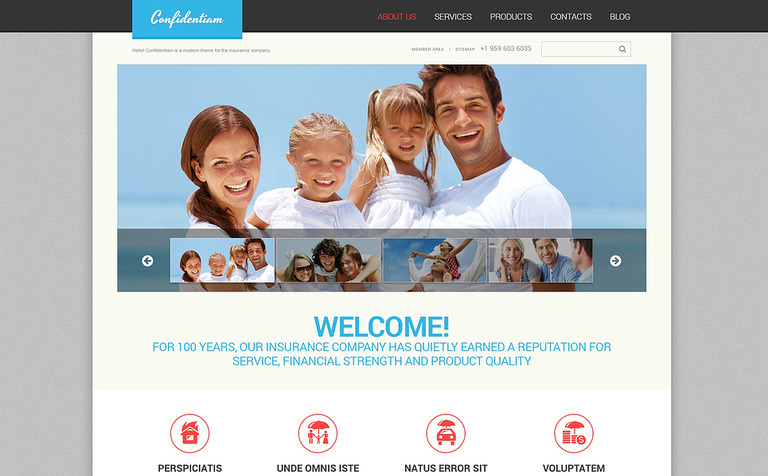 Thanks for sharing the best insurance WordPress themes collection. Your theme list is very helpful for us to find the best one for our insurance or business related sites. Glad my insurance WordPress themes list helped you and you found a theme. Please let me know if you need any help! please add theme to your list, thanks!